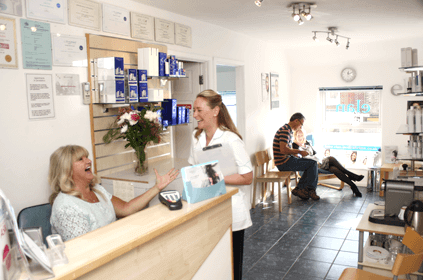 Established in 2000, Elan Medical Skin Clinic in 38 High Street, Rayleigh, Essex SS6 7EF is our flagship clinic. Directions By Road Leave the M25 Motorway at Junction 29 (sign posted A127). Take the A127 heading towards Southend (passing Basildon & Wickford). Turn left at the Rayleigh Weir Roundabout into Rayleigh High Road. Continue along Rayleigh High Road into Rayleigh High Street. Go over the set of pedestrian traffic lights in the High Street. We are on left hand side of the road directly opposite Prezzo Restaurant. Parking is available at two nearby car parks in Bellingham Lane and Websters Way. There is normally unrestricted parking availability on the High Street after 6pm. Directions by rail Rayleigh Station is on the Southend Victoria Line commencing at Liverpool Street (a 60-minute journey). From Rayleigh Station we are just a five-minute walk away. Turn right in to Crown Hill on leaving the main station exit. At the top of Crown Hill, turn left into Rayleigh High Street. Walk along the High Street. Go over the set of pedestrian traffic lights in the High Street. We are on left hand side of the road directly opposite Prezzo Restaurant. At Elan Medical Skin Clinic in Essex, all new patients receive a thorough consultation and medical assessment prior to treatment. The consultation process includes an assessment of your needs and a discussion about the range of treatment options available, both at Elan Medical Skin Clinic and those available elsewhere, including no treatment at all. You are welcome to call Elan Medical Skin Clinic on 01268 770660 between 9.30am and 5pm Monday to Saturday to book an appointment at our Essex Clinic Alternatively, you can complete a Contact Us Form and one of our reception team will contact you by phone or email, whichever you prefer. You will be asked to pay your initial consultation fee by credit or debit card on confirming your appointment.